I think we are going to try this and see if this works! 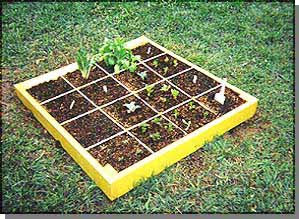 LAYOUT - Arrange your garden in squares, not rows. Lay it out in 4'x4' planting areas. AISLES - Space boxes 3' apart to form walking aisles. SOIL - Fill boxes with Mel's special soil mix: 1/3 blended compost, 1/3 peat moss, and 1/3 coarse vermiculite.